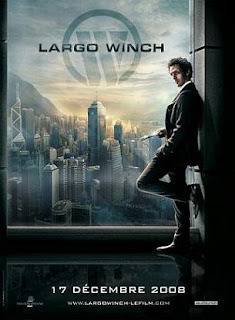 watched a movie called largo winch yesterday. one of the featured films of the french film festival happening only in selected GCS cinemas. it's a very interesting and intriguing show to watch. action movie with quite a lot of talking and strategy planning. i dunno if it should be called a french film though. it's a 1 and a half year old film based on a belgian comic. not counting cantonese which is a dialect. they speak mostly english, french and another language that i can' figure out. and near the end there was russian. it's about a man who's adopted by a very rich man. the very rich man is the head of a big company. now they have to find the young man who's framed for drug trafficking. the interesting mystery and action all starts here. a lot of action scenes. but a lot of brains too.